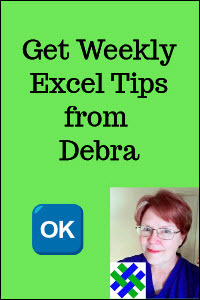 Create Excel names that refer to cells, a constant value, or a formula. 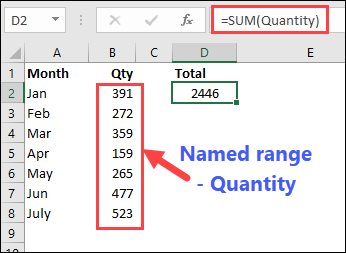 Use names in formulas, or quickly select a named range. 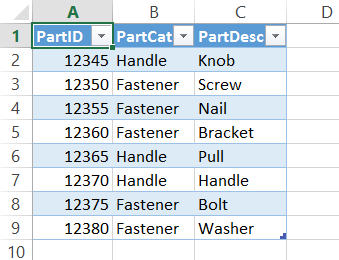 Use those names in a formula, instead of using a constant value or cell references. 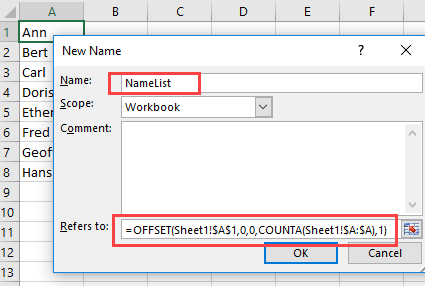 The instructions below show how to create names and use names in your Excel files. 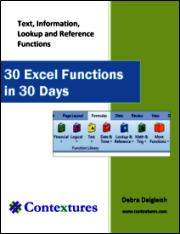 Get the sample Excel workbook, to follow along with the instructions. Type a valid one-word name for the list, e.g. FruitList. 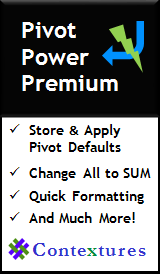 There are rules for Excel names on the Microsoft site, and those are summarized below. 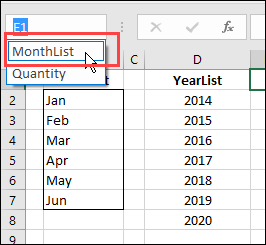 For an in-depth look at what characters are allowed, see Martin Trummer's GitHub project excel-names -- it has written examples, and an Excel file to download. 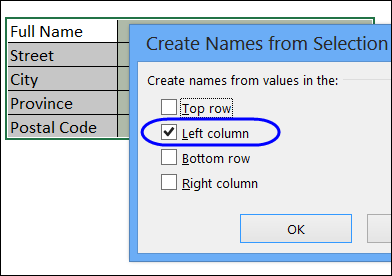 Follow these rules from Microsoft, when you're creating a name in Excel. In the Refers To box, change the range reference, or drag on the worksheet, to select the new range. 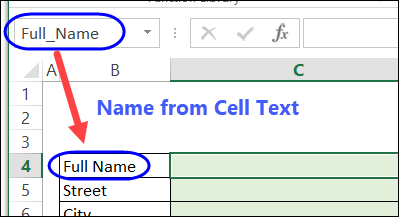 To quickly name individual cells, or individual ranges, you can use heading cell text as the names. Watch this video to see the steps. Written instructions are below the video. A quick way to create names is to base them on heading cell text (worksheet labels). 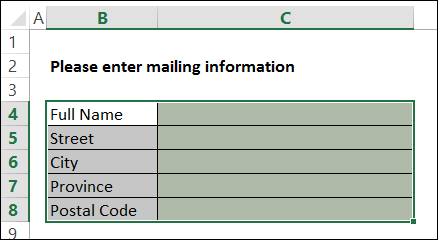 In the example shown below, the cells in column E will be named, based on the labels in column D.
NOTE: If the labels contains spaces, those are replaced with an underscore. Other invalid characters, such as & and # will be removed, or replaced by an underscore character. Select the labels and the cells that are to be named. The labels can be above, below, left or right of the cells to be named. In this example, the labels are in column B, to the left of the cells that will be named. In the Create Names From Selection window, add a check mark for the location of the labels, then click OK. In this example, the labels are in the left column of the selected cells. Click on a cell to see its name. In the screen shot below, cell C4 is selected, and you can see its name in the Name Box -- Full_Name. NOTE: The space character was replaced with an underscore. If a name refers to a range, you can select that name in the Name Box dropdown list, to select the named range on the worksheet. 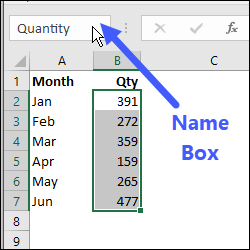 The easiest way to create a dynamic named range is to start by creating a named Excel table. Then, define a range based on one or more columns in that table. 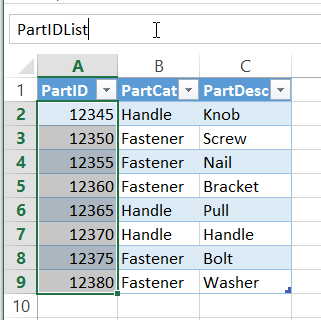 In this example there is a list of parts on the worksheet, and a named table, and dynamic named ranges will be created. Later, if you add new items to the table, the named range will automatically expand. Click the Ribbon's Formulas tab, and click Name Manager. the PartIDList, which is based on the PartID field in Table1. 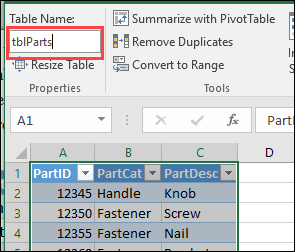 Because the PartIDList named range is based on a named table, the list will automatically adjust in size if you add or remove part IDs in the list. 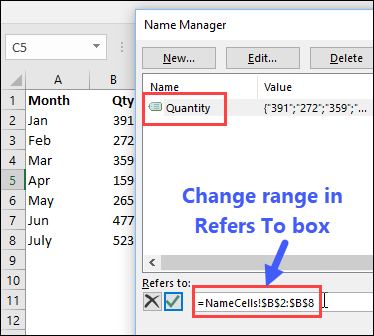 When you create a named range in Excel, it doesn't automatically include new items. 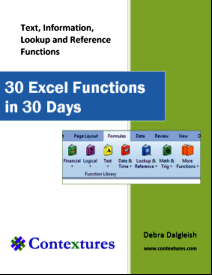 If you plan to add new items to a list, you can use a dynamic formula to define an Excel named range. Then, as new items are added to the list, the named range will automatically expand to include them. 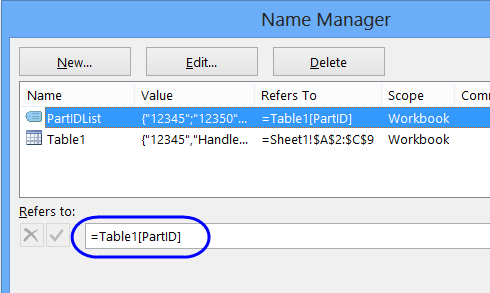 If you don't want to use a named table, you can use a dynamic formula to define a named range. As new items are added, the range will automatically expand. 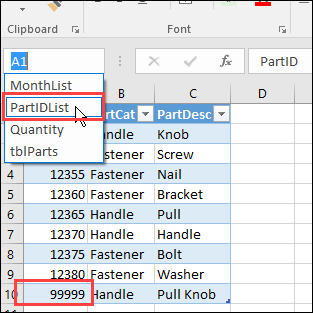 Note: Dynamic named ranges will not appear in the Name Box dropdown list. However, you can type the names in the Name Box, to select that range on the worksheet. Leave the Scope set to Workbook.